The Porsche GT Team tackles round five of the 2018/2019 FIA WEC Super Season with great confidence. At the six-hour race in Shanghai (China) on 18 November, the factory squad from Weissach aims to notch up another success with two ca. 510 hp 911 RSR. 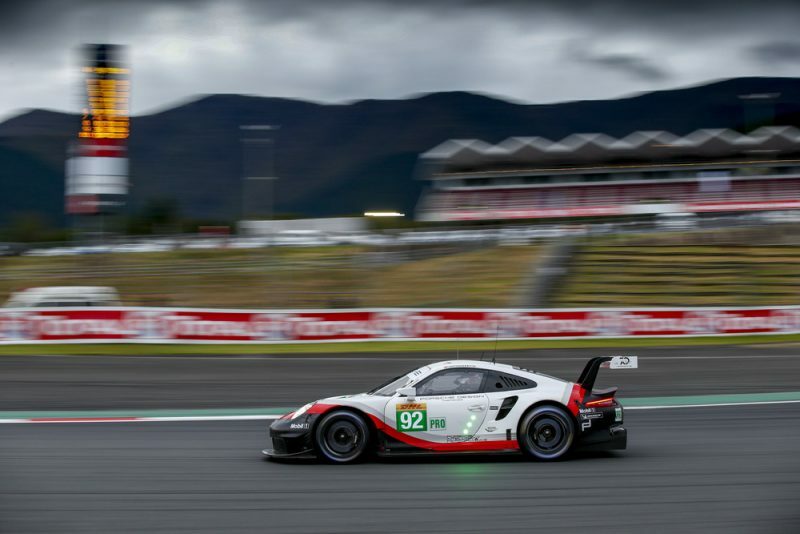 Thanks to a victory at the last race in Fuji (Japan) to conclude the first half of the season, Porsche has consolidated its lead in the GTE-Pro class of the World Sports Car Championship. Porsche is now eager to extend this advantage over the competition from Ferrari, BMW, Aston Martin and Ford at the last race of the 2018 year. Moreover, three customer teams fight for points towards the GTE-Am class with four additional Porsche 911 RSR. The Porsche GT Team has a score to settle at the Shanghai International Circuit. Last year, both 911 RSR were at times on course for victory. Richard Lietz (Austria) and Frédéric Makowiecki (France) lost around 15 seconds when they were shunted by an LMP1 prototype in the last third of the race and finished second. The sister car retired early. In the 2014 season, the Porsche GT Team celebrated a one-two result on the Formula 1 circuit in China. The following year, the Dane Michael Christensen and Lietz won. Shanghai has hosted the World Endurance Championship (WEC) every year since 2012. The Grand Prix circuit places high demands on the tyres and offers many overtaking opportunities. Sharing driving duties in the No. 91 Porsche 911 RSR are Lietz and Gianmaria Bruni (Italy). At the six WEC races contested in Shanghai, the Austrian has climbed the podium four times. Bruni is hoping to claim his first win on the diverse racetrack just outside the Chinese metropolis. Kévin Estre and Christensen share the cockpit of the No. 93 sister car. After their victory at the 24 Hours of Le Mans with Laurens Vanthoor (Belgium), the duo from France and Denmark went on to win the most recent race in Japan. Three customer teams field four additional Porsche 911 RSR in the GTE-Am class. The German Project 1 team, which secured its first WEC victory in Fuji, fields the No. 56 Porsche for Porsche works driver Jörg Bergmeister (Germany), Egidio Perfetti (Norway) and Patrick Lindsey (USA). The Porsche-Junior Thomas Preining will contest his second race in the World Sports Car Championship. The Austrian shares the No. 86 car fielded by Gulf Racing with the two British racing drivers Ben Barker and Michael Wainwright. Dempsey-Proton Racing targets more successes with two Porsche 911 RSR. Porsche Young Professional Matt Campbell (Great Britain), Porsche-Junior Julien Andlauer (France) and Christian Ried (Germany) currently lead the championship with the No. 77 car. Sharing driving duties in the No. 88 sister car are Porsche Young Professional Matteo Cairoli from Italy, his compatriot Riccardo Pera and Khaled Al Qubaisi (United Arab Emirates). The Porsche 911 RSR celebrated its World Sports Car Championship (WEC) debut at Silverstone in 2017. So far this season, the racer from Weissach has clinched a one-two result in the GTE-Pro class at Le Mans and secured the GTE-Am category class win at the endurance classic in France as well as at the Silverstone race. The RSR with its four-litre boxer engine is based on the seventh generation of the iconic 911 sports car and produces around 510 hp depending on the restrictor. With a total of six vehicles, the Porsche brand is represented by the largest contingent of GT racers in the World Sports Car Championship. The six-hour WEC race in Shanghai gets underway on Sunday, November 18, 2018, at 4:00 hours CET (11.00 hrs local time).